Thyroxine is a hormone made by the thyroid gland in the neck. It is carried round the body in the bloodstream. It helps to keep the body's functions (the metabolism) working at the correct pace. Many cells and tissues in the body need thyroxine to keep them going correctly. Underactive thyroid gland (hypothyroidism) results from the thyroid gland being unable to make enough thyroxine, which causes many of the body's functions to slow down. Hypothyroidism may also occur if there is not enough thyroid gland left to make thyroxine - for example, after surgical removal or injury. When your thyroid doesn't produce enough hormones, the balance of chemical reactions in your body can be upset. There can be a number of causes, including autoimmune disease, treatment for hyperthyroidism, radiation therapy, thyroid surgery and certain medications. Your thyroid is a small, butterfly-shaped gland situated at the base of the front of your neck, just below your Adam's apple. Hormones produced by the thyroid gland — triiodothyronine (T3) and thyroxine (T4) — have an enormous impact on your health, affecting all aspects of your metabolism. They maintain the rate at which your body uses fats and carbohydrates, help control your body temperature, influence your heart rate, and help regulate the production of proteins. People who develop a particular inflammatory disorder known as Hashimoto's thyroiditis have the most common cause of hypothyroidism. Autoimmune disorders occur when your immune system produces antibodies that attack your own tissues. Sometimes this process involves your thyroid gland. Scientists aren't sure why the body produces antibodies against itself. Some think a virus or bacterium might trigger the response, while others believe a genetic flaw may be involved. Most likely, autoimmune diseases result from more than one factor. But however it happens, these antibodies affect the thyroid's ability to produce hormones. 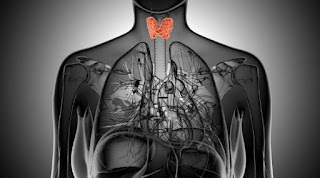 People who produce too much thyroid hormone (hyperthyroidism) are often treated with radioactive iodine or anti-thyroid medications to reduce and normalize their thyroid function. However, in some cases, treatment of hyperthyroidism can result in permanent hypothyroidism. Removing all or a large portion of your thyroid gland can diminish or halt hormone production. In that case, you'll need to take thyroid hormone for life. A number of medications can contribute to hypothyroidism. One such medication is lithium, which is used to treat certain psychiatric disorders. If you're taking medication, ask your doctor about its effect on your thyroid gland. Some babies are born with a defective thyroid gland or no thyroid gland. In most cases, the thyroid gland didn't develop normally for unknown reasons, but some children have an inherited form of the disorder. Often, infants with congenital hypothyroidism appear normal at birth. That's one reason why most states now require newborn thyroid screening. A relatively rare cause of hypothyroidism is the failure of the pituitary gland to produce enough thyroid-stimulating hormone (TSH) — usually because of a benign tumor of the pituitary gland. The trace mineral iodine — found primarily in seafood, seaweed, plants grown in iodine-rich soil and iodized salt — is essential for the production of thyroid hormones. In some parts of the world, iodine deficiency is common, but the addition of iodine to table salt has virtually eliminated this problem in the United States. Conversely, taking in too much iodine can cause hypothyroidism. ~ Goiter. Constant stimulation of your thyroid to release more hormones may cause the gland to become larger — a condition known as a goiter. Hashimoto's thyroiditis is one of the most common causes of a goiter. Although generally not uncomfortable, a large goiter can affect your appearance and may interfere with swallowing or breathing. ~ Heart problems. Hypothyroidism may also be associated with an increased risk of heart disease, primarily because high levels of low-density lipoprotein (LDL) cholesterol — the "bad" cholesterol — can occur in people with an underactive thyroid. Even subclinical hypothyroidism, a mild or early form of hypothyroidism in which symptoms have not yet developed, can cause an increase in total cholesterol levels and impair the pumping ability of your heart. Hypothyroidism can also lead to an enlarged heart and heart failure. ~ Mental health issues. Depression may occur early in hypothyroidism and may become more severe over time. Hypothyroidism can also cause slowed mental functioning. ~ Peripheral neuropathy. Long-term uncontrolled hypothyroidism can cause damage to your peripheral nerves — the nerves that carry information from your brain and spinal cord to the rest of your body, for example, your arms and legs. Signs and symptoms of peripheral neuropathy may include pain, numbness and tingling in the area affected by the nerve damage. It may also cause muscle weakness or loss of muscle control. ~ Myxedema. This rare, life-threatening condition is the result of long-term, undiagnosed hypothyroidism. Its signs and symptoms include intense cold intolerance and drowsiness followed by profound lethargy and unconsciousness. A myxedema coma may be triggered by sedatives, infection or other stress on your body. If you have signs or symptoms of myxedema, you need immediate emergency medical treatment. ~ Infertility. Low levels of thyroid hormone can interfere with ovulation, which impairs fertility. In addition, some of the causes of hypothyroidism — such as autoimmune disorder — can also impair fertility. ~ Birth defects. Babies born to women with untreated thyroid disease may have a higher risk of birth defects than may babies born to healthy mothers. These children are also more prone to serious intellectual and developmental problems. Infants with untreated hypothyroidism present at birth are at risk of serious problems with both physical and mental development. But if this condition is diagnosed within the first few months of life, the chances of normal development are excellent.